It’s holiday! Thanks to our Muslim brothers and sisters We were able to have a long weekend and for me, an early weekend after this 4 days of physically stressful work. I’m so happy I got to get more than enough sleep this day, roughly around 11 hours. Well, I only get not more than 5 hours of sleep during weekdays so this is an achievement. Like every other start of weekend, I usually do the laundry and today is not an exception. Luckily, it did not rain today and the sun, though not as hot as summer, has his light shining brightly. After I woke up, I ate lunch with my family and proceed with the laundry. This is not an easy task but I find it therapeutic. Its as if I’m also washing away the stress of the weekdays. In the middle of the task, I got hungry and I should take a break. Its a good thing we have some left over bottles of mushrooms, black olives, cream cheese and sun dried tomatoes. I saw unopened bag of tasty bread and voila, egg omelette and toasted bread this afternoon. This is a very simple dish to prepare and yet its very tasty. I cracked open the eggs and slice of butter in a room temperature pan and cooked it in high heat. 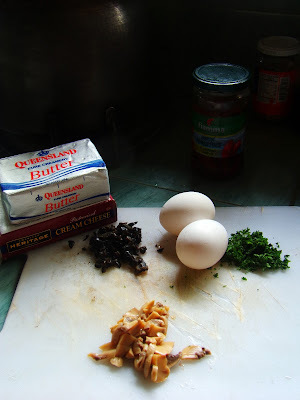 When its already creamy and fluffy, I throw the chopped mushrooms, black olives, cream cheese and parsley. For the toasted bread, heat the pan with butter and place the bread on it until golden brown and flip it to cook the other side. This egg omelette is not the common type of omelette but a fluffy and creamy consistency type. I like the creaminess of this omelette coming from the eggs and butter, the saltiness from the cream cheese and olives and the earthy flavor the mushrooms give. It has a nice harmony in every bite and buttery crispiness from the toasted bread. You can cook it to impress your love ones for breakfast or you can just simply enjoy it on your own. 1. In a room temperature pan, cracked eggs and add butter. Cook in a high heat with continuous stirring, removing from time to time so not to over cooked the eggs. You will know if its already done if its still moist and has fluffy and creamy consistency. Remove from heat to stop further cooking. 2. Add olives, mushrooms, cream cheese and parsley and mix well. 3. Taste and season with salt to suit your taste. Serve with toasted bread and garnish with sun dried tomatoes.